Your backyard can easily be prettied up, and it doesn’t require a large budget. When was the last time you did anything to your backyard? The chances are it’s been awhile. With that said, below are five ways to pretty up your backyard. You can create a seating area in your backyard. Adding a bench, a chair, or other types of outdoor furniture can make a huge difference. Make the most out of your seating area by placing the furniture in an optimal layout. Once set up, plant a garden around it, but leave a space to serve as the entryway to the garden. There are various types of gardens to plan, such as food, floral, plant, or a vegetable garden. If you don’t want to plant a real garden, then no worries. Buy fake floral arrangements and plant them around your seats. Building a deck or patio will not only pretty up your backyard, but it will provide you with additional space. You can use this space as an entertainment area or a seating area where you can relax or entertain your guests for a few hours. Additionally, your home’s value will increase, so you will get more for it if you decide to sell it. Installing a shed in your backyard is another option. If you don’t want to pay a lump sum of money for one, then consider shopping around for rent to own sheds. Some companies, such as Backyard Outfitters supply portable buildings for sale or rent. The company sells an array of sheds, but they can also build you a customized shed. There are a number of ways to use a shed. It can serve as purely decoration purposes or you can use it to store your belongings, as in a tool shed or garden shed. 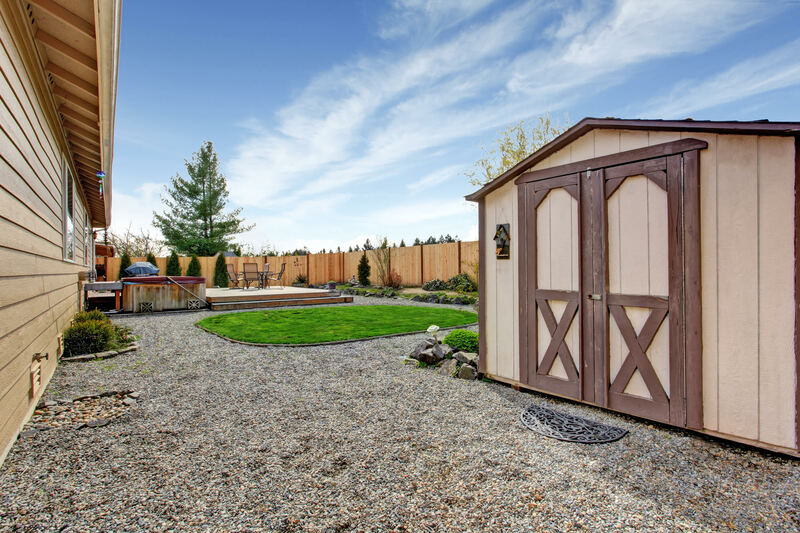 Whatever you use it for, a shed will spruce up your backyard. Installing a fountain in the middle of your backyard can not only change the look of your yard, but also relieves stress and promotes relaxation. Doing this will instantly transform your yard and add a bit of ambiance to it. With dozens of options out there, finding the ideal fountain will be easy to do. Another good way to spruce up your backyard is by implementing lighting. There are many ways to do this, such as placing a few lanterns in the yard, or if you have a wall in your backyard you can install wall lighting. Additional options include lanterns and path lights. When it comes to lighting, you have no shortage of options. Lights are also good safety features. You’ll be able to walk in your backyard at night, without worrying about not seeing or injuring yourself. When it comes to prettying up your backyard, you can create a seating area, have a deck or patio built or shop around for rent to own storage sheds. Buying a fountain and implementing lighting are other good ways to create a backyard oasis to be used for years to come.